I love boxed rice pilafs. They make dinners so easy. Saute some chicken, steam some veggies, and all the while let a nice rice pilaf simmer away on the stove. The only catch is that I’ve been trying to eat more clean, whole foods, and less things processed foods from boxes. Enter this Tomato Basil Farro Recipe as a great side dish. There are some boxed rice pilafs that I still buy, but I’m more discerning about which brands I’ll buy. Ultimately, I think from-scratch is always better when you have the time. This farro dish isn’t the fastest, but it is simple and tasty. Almost as simple as making a pre-packaged rice pilaf. Almost. I came up with this recipe for my dad during Father’s Day weekend since he’s a big fan of whole grains but somehow hadn’t tried farro yet. I wanted to do something simple without requiring a lot of extra ingredients, and this worked perfectly. I use both dry and fresh basil to get a good mix of basil flavors. Though this isn’t the fastest side dish, I like to think it makes up for that by being extra easy and by using few ingredients. Heat oil in a medium-large pot over medium heat. Add garlic and saute until fragrant, about 60 seconds. Add farro, broth/stock, tomatoes, basil, and salt. Stir to combine. Bring to a boil. 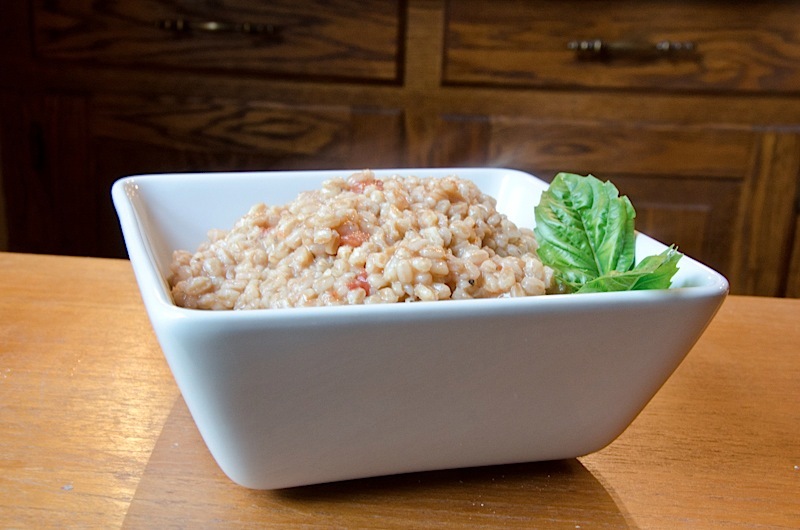 Reduce heat to simmer and cook until farro is tender to liking, about 30-40 minutes. If needed, season with salt and pepper to your taste preference. Serve topped with the fresh basil or place the basil in a small bowl next to the farro. Enjoy! 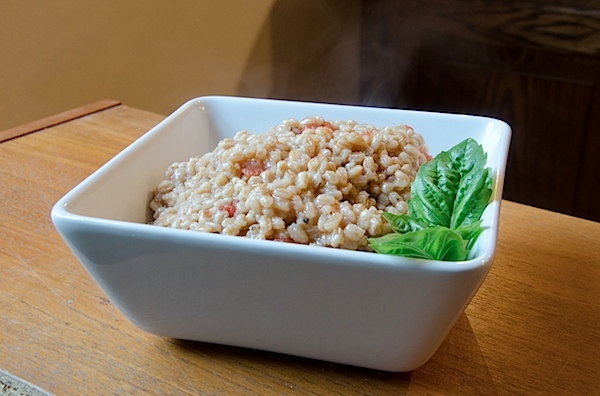 Tip: Try pre-cooked farro for a shorter cook time. Trader Joe’s has a nice 10 minute farro that I love to use. 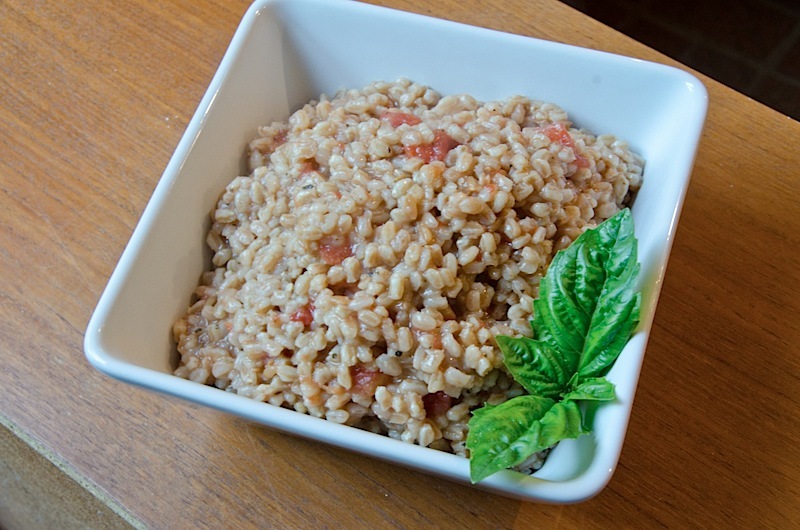 Sis remarked that this Tomato Basil Farro Recipe yielded a side dish that was similar in taste to margarita pizza. I guess the only thing missing would be the mozzarella, but that could be a fantastic addition. I may have to try that next time. Reader question: Do you like boxed rice pilafs? If yes, what’s your favorite kind? i think the last time i bought a boxed rice pilaf was on our honeymoon, three years ago! but i do make them at home fairly often…last night was pineapple & black bean brown rice, served with pulled jerk chicken. my husband adores rice! i think he’s a little scared of other grains though… 🙂 this looks amazing. I found this recipe doing a pinterest search of farro. It is fantastic!!! I am looking forward to discovering more your recipes! Woohoo! Glad you like it. Hope you enjoy some of the other recipes here! 🙂 Thank you! Made this tonight for dinner. I added some baby spinach and grated cheese. It was delish! Thanks for the recipe!! !